Most people have resolutions for the new year, and Community Managers are no exception. 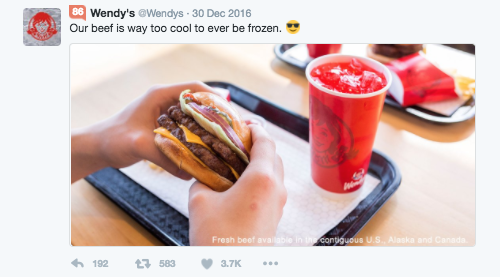 Total speculation here, but it seems like the person handling responses for Wendy’s Twitter account resolved to adopt a zero tolerance policy on social media negativity for 2017, and boy are they off to a great start! Whoever was managing the account decided they’d take no bull. Apparently, the sick burn was so severe that the Twitter user, @NHride deleted their account. Thanks to Twitter user @Fraxtil for finding this exchange.